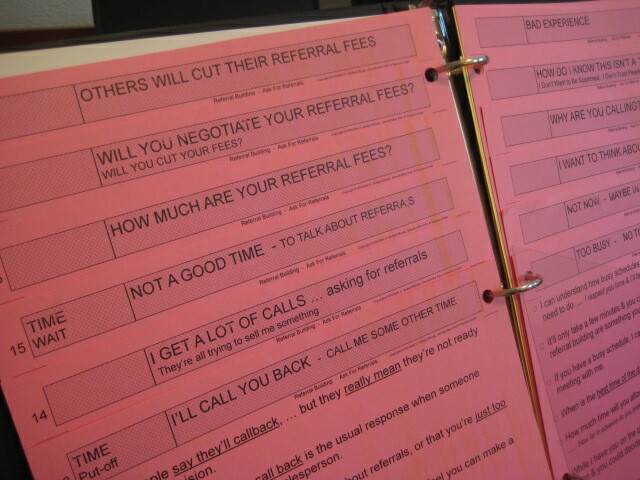 Telemarketing referrals scripts are for written to "Ask other professionals for referrals." Having the right words to say is critical when asking a professional to send you referrals. 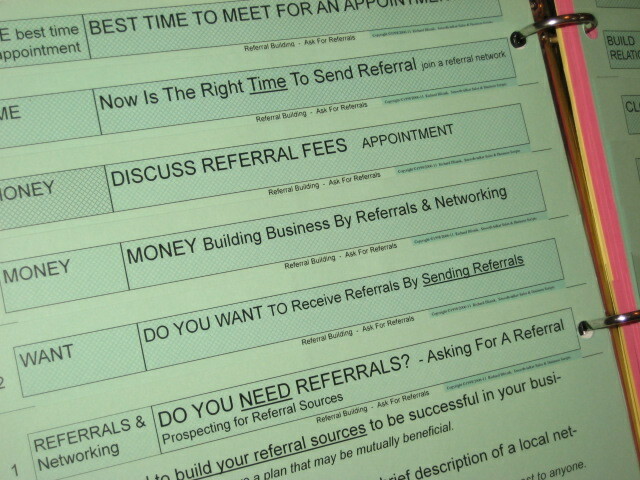 Sales professionals want the most cost effective way to build their business is to use a telemarketing referral script. Written for all types of telemarketing professionals that require them to make prospecting calls to get referral business. 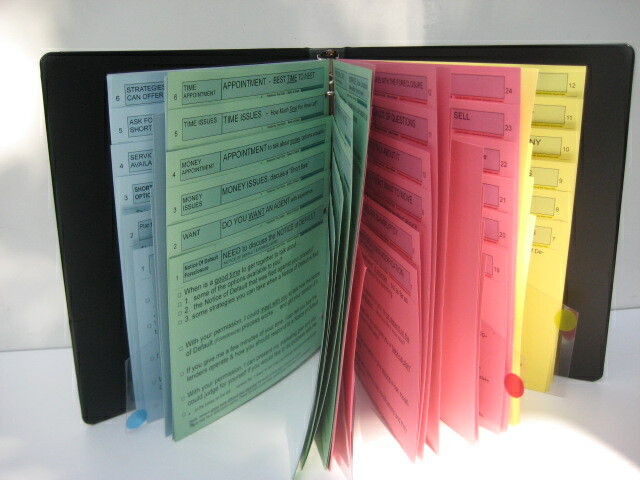 Telemarketing & sales-assistants referral scripts are completely They come in a 3-ring binder with 4 color-coded section flippers. cut-down & assembled. They're ready to use right out of the box. Telemarketing referral scripts are written to help you build your referrals business by saying the right things to a referral source. To get referral business you need to establish a relationship with referral sources in your area and simply ask them to think of you when they come across a person who is an ideal candidate to buy your product or service. You must make it easy for other professionals to send you a referral by keeping your name and professional profile in front of them. Telemarking for building referral business is talked about in business development. Getting referral business depends on having a telemarketer prospecting for referrals say the right things. Smooth-talker scripts for telemarketers building referral business has written the referral script that address the problems. Prospecting for referrals using sales-assistants is the most cost effective method to get referals. Referrals are by far the "most cost effective method" of business development and lead generation. There are many reasons why a referral customer is the most valuable you can get. Referral customers come highly recommended so the customer perceives you to be qualified to handle their business. Reasons to use a telemarketing approach. Getting referrals through better scripting. Telemarketing scripts for referrals were written to help telemarketers and sales-assistants build business by better scripting. A telemarker must build trust and build a relationship. Scripts for sales assistants referrals were written as a result of discovering that sales professionals have difficulty with asking others to help them build business by exchanging referral clients. It may take time but the results are well worth it. Having a well thought out telemarketing script will guarantee that they will send you referrals. Referral telemarketing scripts are designed for asking other professionals for referrals. Having a well written script for getting referrals gives you many ways to say something instead of just one way. Scripts for referrals insures that telemarketers give the same uniform message, guarantees, and policies that the company must stand behind. When a telemarketer is skillful with the words they don't have to constantly sell, use pressure or be manipulative. Prospecting for referrals using the telephone is the best connection that can be made. A telemarketer can ask for referral business and you get immediate results. Sales-assistants choose the time to make the call to the people you wish to get referrals from. It costs relatively little money for a telemarketers to ask for a referrals. Telemarketing scripts for referrals were invented to cope with the most high stress activity of the business world, that of making a call to ask for referrals. Approaching a person you have never met is difficult enough, and asking them for future business referrals isn't their first priority. Unless you have good reasons, ie: a professional script using the proper words, for them to send you referral business, you are just like any other salesperson who calls. 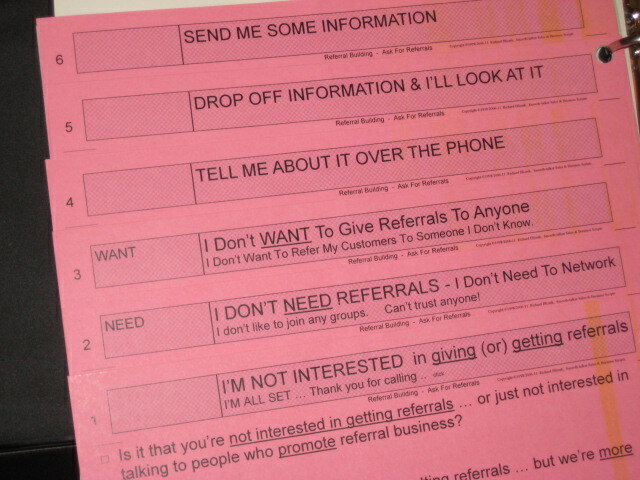 This is a list of the page headings for the telemarketers referral prospecting scripts. 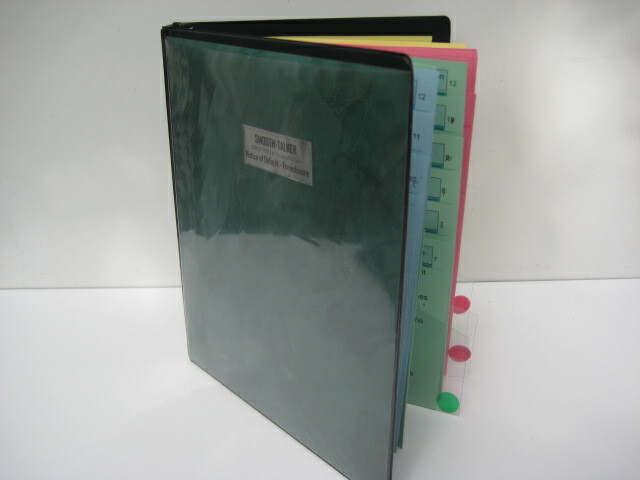 GREEN 24 pages of scripts. You are doing the talking & conversing about getting referral business. 12 pages of Lead-off scripts & Sales-openers. The dialogue identifies you, gives a reason for the call, and states a brief message. Asking for referrals. Building our business by asking for referrals. My plan to build a referral network. 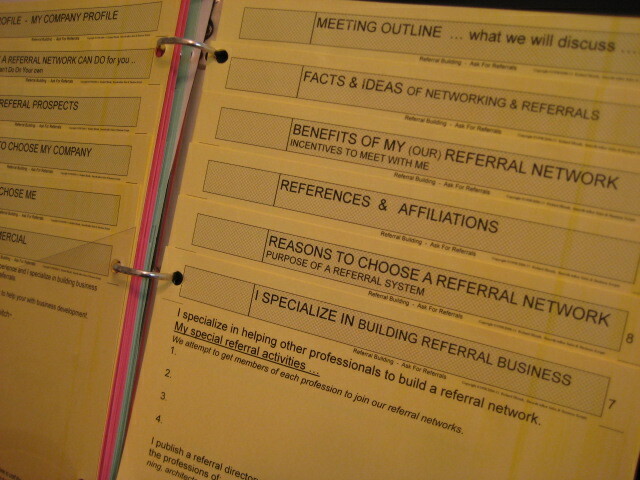 Invite you to a referral workshop. Follow-up call after a recent contact. Follow-up call after mailing. I'm Forming a referral network. Replacing prospects through referrals. RED pages contain Questions that must be answered & Objections that must be responded to. approach to the objection. These are the "most often heard" objections & questions. It was difficult for us to write a telemarking for a referral script. It was an extremely difficult to write a telemarketing referral script because it not like the prospecting scripts to sell products or services. The usual dialogue didn't apply. Writing a sales-assistant script for referrals concentrated on words that were non-offensive and were loaded with benefit statments. Sales people rationalize and have thousands of excuses to avoid the possibility of appearing to have a weakness. Instead, they just do not prospect for referrals. For sales professionals who can't take conflict, the answer is to blame the prospect for being unreasonable. We take the path of least resistance by not picking up the phone and making a prospecting call, hence we often hire a specialist such as a telemarketer or sales-assistant to make the calls. Salespeople, telemarketers, and sales-assistants don't say the right things unless that have a script to work from. Telemarketers prospecting for referrals never say the same thing twice, consequently they don't get good at what they say. It really boils down to feeling that you won’t know what to say therefore if you avoid the telephone call to the prospect, you’ll rule out the possibility of feeling bad.